In our family, every year on your birthday you got to pick the meal you wanted made for the family birthday celebration. While I don’t think this is a terribly unique tradition I do think the menus that have graced our family table over the years on the occasion of my or my sister’s birthday are. One year my little sister asked for baby carrots stuck into giant black olives, canned mandarine oranges served in ramekins and eaten with shrimp forks; and her drink served out of a liquid medicine measurement spoon - she is a real unique soul, that one. I often requested supper nachos or egg kaka and my older sister’s menus usually rotated around cheesy mashed potatoes. As for desserts we’ve each explored different sweets – french silk pie, birthday cake cones, angel food cake, brownies. There is one phase we have all gone through though, the rum cake phase. For as long as I can remember my mother’s rum cake, with it’s dense cake soaked in a sweet boozy sauce, has appeared on the table at least once a year for someone’s birthday. It’s a recipe she learned from her mother that relies on boxed cake mix and when she makes it it’s perfection. In culinary school I made it one of my projects to recreate the cake from scratch and after a few tries – mostly figuring out the egg factor – I nailed it. 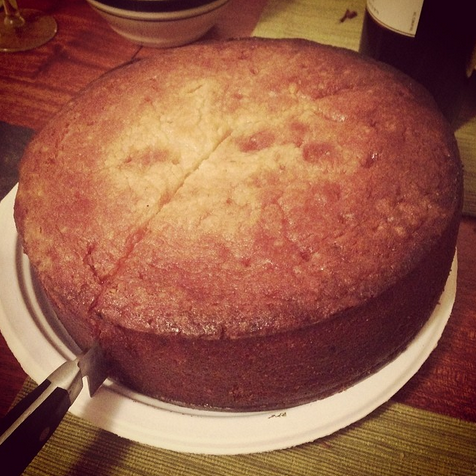 It’s the recipe I now use when I’m tasked with making rum cake, as I was a few weeks ago when I made my little sister’s birthday dinner (she’s matured into a rather sophisticated menu of pot roast and salad), which also served as the impetus for this post. If you’re looking to start a new addiction tradition give this a try immediately. Spray one angel food pan with a removable bottom*. Set aside. Cut up the butter into 1-inch pieces and place them in the large bowl of an electric mixer, fitted with a paddle attachment or beaters. Beat for 3 minutes on medium-high speed until the butter is light and creamy in color. Stop and scrape the bowl. Add the sugar, 1/4 cup at a time, beating 1 minute after each addition. Add the eggs & yolks one at a time, beating for 30 seconds after each egg. Scrape the sides of the bowl occasionally. Reduce the mixer speed. Stir vanilla into the buttermilk. Add the dry ingredients alternately with the buttermilk. Mix just until incorporated. Scrape the side of the bowl and mix for 15 seconds longer. Spoon the batter into the prepared pan and smooth the top with a knife. Lift up the pan with the batter, and let it drop onto the counter top to burst and air bubbles, allowing the batter to settle. Center the pan onto the lower third of the oven and let bake 45 to 50 minutes or until the cake is lightly brown on top and comes away from the sides of the pan and a toothpick inserted in the center comes out clean. While the cake is baking combine the sugar, water and butter for the rum sauce in a pan on the stove. Bring to a boil then add the rum. Using a skewer poke holes in the fresh out of the oven cake then pour the rum sauce over the warm cake. Let the cake cool then remove from pan. *I used a spring form for the cake pictured and it works just fine but if you have the angel food pan I highly recommend using it.